1-Sainte Victoire: Chalet of 160 sq.m which can accommodate 17 persons. 2- Pastorale and Garrigue: 2 new chalets (June 2011) that each welcome 15 persons or 30 persons in total when they are joined thanks to a semi-detached entrance & a communicating door. 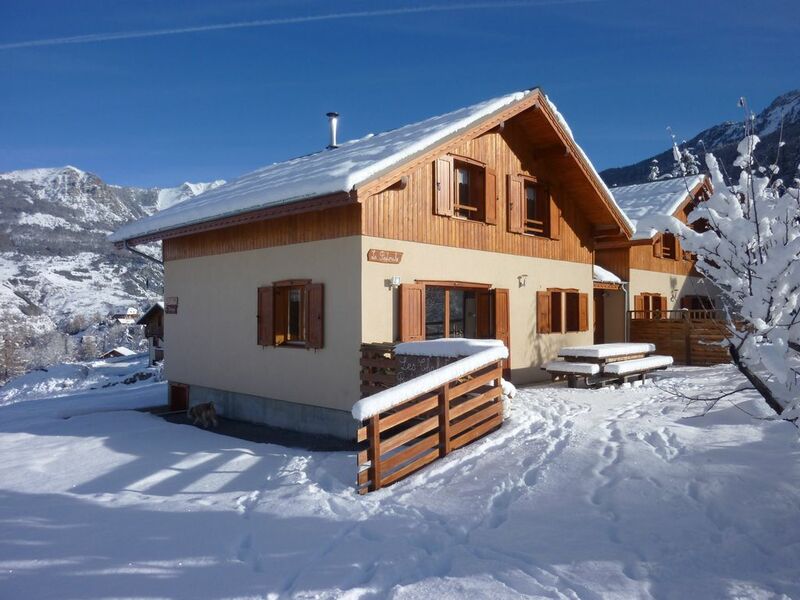 Our 3 chalets are completely separate: different buildings for complete noise discretion, different entrances, protected outdoor spaces and 4 individual parking areas for each chalet. They are rented independently or together depending on the needs of the holiday makers who we can welcome for a successful stay at the Orres station. Built in the locality of Pramouton our chalets are close to the 'Pramouton' ski lifts & the shuttle bus stop which leads to the central station about 800m away. This free shuttle runs continuously from 8:30 a.m. to 6:15 p.m. The location if the chalets w/ balconies overlooking a valley with view over the lake, at the heart of the mountains, is a privilege in winter as much as in summer: they are 200m from the pool & tennis courts & 1km from the via ferrata site appreciated by those who climb the Alps. Beautiful mix between tradition & comfort, built entirely of wood & only w/ products which respect health & the environment, mainly glassed to enjoy the many views over the surrounding mountains, our chalets have a welcoming capacity adjustable from 4 to 47 persons taking in consideration their immediate proximity to one another. We study all your requests & are very flexible in order for you to come & spend an excellent stay in the mountains. Our chalet has a large bathroom with bathtub and large wash basin on the garden level and a spacious shower room w/ a shower cabin with massage jets on the 1st floor. These 2 bath areas are lit by daylight thanks to the large openings looking onto the surrounding mountains. Pastorale & Garrigue, our 2 new chalets: Entirely built in spruce, all materials & protective products are eco friendly & respect the environment. No product harmful to health has been used after their auto-construction in 2010-2011. Exactly the same & separate by their access, their parking areas, their interior space, they can each welcome 15 persons or 30 together thanks to the semi-detached gateways & the communicating door. Nevertheless, the chalets are separated by the 2 reception halls constitute 2 separate buildings & are perfectly acoustically separate. They offer a large hall where one leaves their skis, anoraks & shoes, a large living room of 45 sq.m wit fully equipped oak kitchen (refrigerator, freezer, ovens, dishwasher) a large table for meals for 16 persons, a living room w/ stove-chimney and large convivial space, 4 bedrooms, 2 bathrooms 2 toilets.